Home » film festivals , movies , south by southwest , the people vs george lucas » THE PEOPLE VS. GEORGE LUCAS premieres tomorrow at SXSW! THE PEOPLE VS. GEORGE LUCAS premieres tomorrow at SXSW! 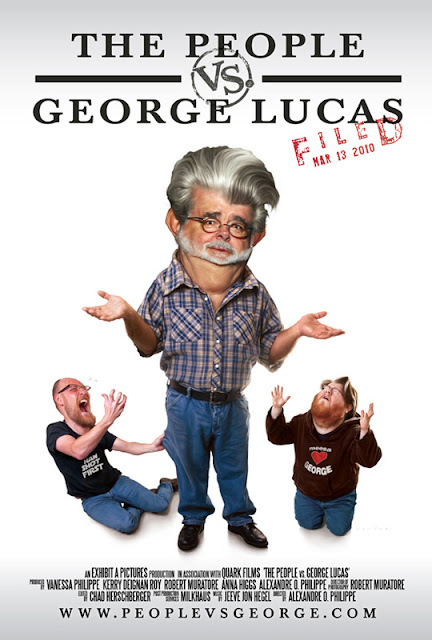 A friendly reminder for those of you lucky enough to be attending South By Southwest (SXSW) 2010 in Austin, Texas (which begins today) that Alexandre O. Philippe's much-anticipated documentary The People vs. George Lucas will have its world premiere tomorrow night! Man oh man, wish I could be going to this thing (I will be attending a production of Sweeney Todd: The Demon Barber of Fleet Street this weekend though :-). The People vs. George Lucas has already started garnering some high-profile attention and it's prolly gonna skyrocket after tomorrow night. Here's the latest trailer for it. And yes: that is Melody Hallman Daniel from our own film Forcery that you see at 44 seconds into it! Anyhoo, if you're at SXSW 2010, check it out!